The Kalikambal Temple is a temple dedicated to not just one, but two lords. It is here that the idols of Shri Kaligambal (Kamakshi) and Lord Kamadeswarar are worshipped. With an already picturesque location at the Parry's corner in Old: George Town, this temple with its characteristic Dravidian architecture is breath-taking to say the least. As per history, the temple had a different location earlier, much closer to the seashore than what it is today. It is in the 16th century that it was relocated to its current location on the street parallel to a prominent financial street called the Thambu Chetty Street. Even the great Maratha warrior, Chatrapati Shivaji Maharaj has worshipped this temple back in the 17th century. As per legends, there was fierce goddess who was worshipped here, who was later replaced by the Goddess Kamakshi in the form of shanta swaroopa or the calm posture. Also, visit the popular attractions in the city by following Chennai itinerary 1 day. How popular is Kalikambal Temple? People normally club together Sri Parthasarathy Swamy Temple and Marina Beach while planning their visit to Kalikambal Temple. People also prefer to end their day with Kalikambal Temple. 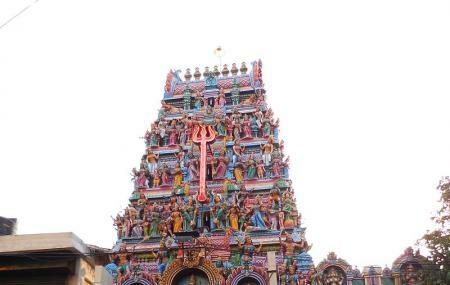 A famous temple in Chennai. It'll always be crowded so it's better to start early. Tip: If travelling in a car, it's better to park it in main road and catch a auto to reach the temple Because the roads to the temple are very narrow. Nice place to visit. Management people's are so kind. I went with my baby. They allowed in special way. Only thing is except sunday car parking is little difficulty to find a place. One of the oldest temple in Chennai. It was in Secretariat during British period and Great Marathi warrior Shivaji worshipped Goddess Kaalikambal. No proper parking facility. Goddess Kaalikambal is very beautiful . One of the oldest temple in Chennai. We could feel the vibe when we enter sanctum. Mostly crowded. I am visiting this temple almost for 3 decades. I experience the vibe whenever I visit this temple.